Level 1: Each drone deals 5.4 (+0.54/lvl) damage on impact. Level 2: Each drone deals 8.1 (+0.81/lvl) damage on impact. Level 3: Each drone deals 10.8 (+1.8/lvl) damage on impact. Level 1: Range of 7 and 30 (+3/lvl) damage per strike. Level 2: Range of 9 and 35 (+3.5/lvl) damage per strike. Level 3: Range of 11 and 40 (+4/lvl) damage per strike. Level 1: Range of 7 and 10 (+1/lvl) damage per strike. Level 2: Range of 9 and 15 (+1.5/lvl) damage per strike. Level 3: Range of 11 and 20 (+2/lvl) damage per strike. 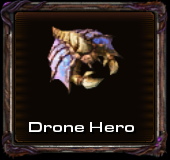 Allows the drone hero to summon a brood lord. Brood lords are powerful air units that shoot broodlings at ground units. The life and damage of the brood lords and broodlings scale with the hero's level. Level 1: 150 energy cost and 90 second cooldown. Maximum of 5 broodlords at any given time. Level 2: 100 energy cost and 60 second cooldown. Maximum of 8 broodlords at any given time. The Brood Lord shoots broodlings at its target. A broodling is a small creature that can attack ground units.